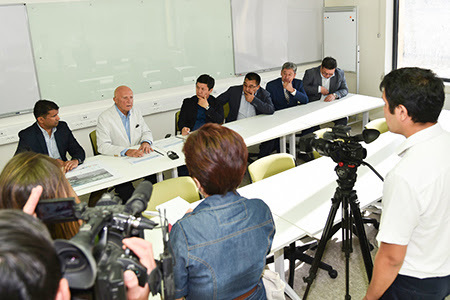 There’s been a lot of activity in the Kyrgyz press this week following Prime Minister Temir Sariev’s visit to the Naryn campus of the University of Central Asia, which is at long last due to start accepting students for a first cohort in 2016/17. Kyrgyz Prime Minister His Excellency Temir Sariev visited the University of Central Asia’s (UCA) campus site in Naryn on 14 August 2015. He was accompanied on a tour of the campus facilities by UCA Director General Dr Bohdan Krawchenko. 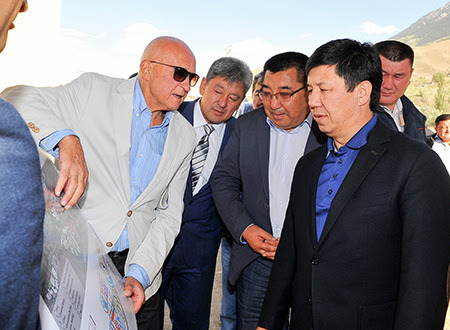 UCA Director General Dr Bohdan Krawchenko (left) explains UCA’s phased construction plan to His Excellency Prime Minister Temir Sariev (far right). During his visit, the Prime Minister noted that the University is a great contribution to the strategic development of not only the Naryn region, but to the whole of Kyrgyzstan. “UCA is robust and well planned, offering good conditions for students to acquire knowledge and become competitive specialists, not only in Kyrgyzstan but internationally. Your contribution to social development is significant. It is good that you seek the most talented students, because students are beginning to think in terms of knowledge, not personal gain,” said the Premier. UCA was established through a unique partnership and an international treaty and charter signed by the Presidents of Kyrgyzstan, Tajikistan and Kazakhstan and His Highness the Aga Khan. Following a brief presentation by Krawchenko in the campus courtyard, the Prime Minister toured the interior of the academic building, where under-floor heating is currently being installed, reviewing progress and the quality of construction. He then visited a faculty apartment. 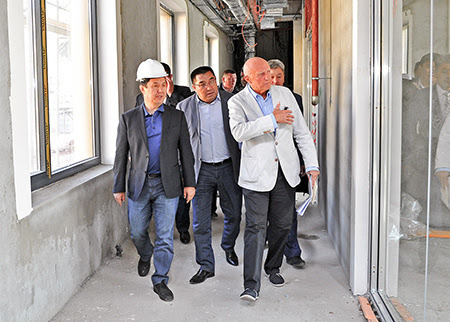 His Excellency Prime Minster Sariev (left) and UCA Director General Krawchenko tour the interior of the Academic Building at UCA’s Naryn campus. The Naryn campus will open in September 2016. The first class of 60 students will primarily be from UCA host countries. To ensure that the brightest students across the region can attend, they will have access to financial aid in the form scholarships, grants, loans and work study programmes. Quality faculty from around the world and the region are being recruited and academic programming and curriculum development is being designed in response to local and regional economic realities. His Excellency Prime Minister Sariev (third from left) listens as UCA Director General Bohdan Krawchenko presents UCA’s ambitious agenda. As part of its ongoing commitment to UCA host communities, the Aga Khan Development Network, of which UCA is a member, is working with the Kyrgyz government to make strategic investments in the infrastructure of Naryn town. These investments will support the town’s transition into a university town, and include the development of a university inn and additional housing, an early childhood development centre and a family medicine and diagnostic centre.